This is an amazing example of Victorian Theatre design and seats 1000 visitors. This is a very versitile venue as you can roll away the seats in the center section meaning it can be used for tea dances for example. In 2012 this venue will be hosting Elaine Page and Dara O'Briain. Take a look at www.harrogatetheatre.co.uk which runs the box office for the Royal Hall to see the event schedule for all three venues. This is a 800 seater venue which is playing host to big names in comedy such as John Bishop and Jack Dee for 2012. The Harrogate Theatre is rapidly becomming known as the comedy capital of the North. 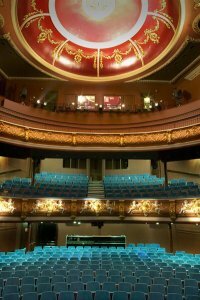 Harrogate Theatre has two performance areas with the main hall and the second performance area newly developed called the Studio Theatre which is used for smaller more intimate performances as well as the occasional art display. Harrogate Theatre also works closley with the local community and often hosts high quality amature performances. See www.harrogatetheatre.co.uk for their latest scheduling information.